In 1898, Alexander Gimbal founded the Gimbal Candy Kitchen in bustling downtown San Francisco. Four generations later, all of us at Gimbal's Fine Candies remain passionate about making delectable treats. We love candy! Our motto is - "Making Gourmet Candies for Everyone Everyday." From old-time favorites, to fun and innovative new candies - everything we create is made with pride in USA. With May being Celiac Awareness Month, Gimbal's wrote and asked if I would be willing to review some of their candies and share my review with my readers. Of course, I said yes and was very excited to spread the news about this company. So, for this review I was sent two bags of Sour Gourmet Jelly Beans (made with real fruit juice) and two bags of Gourmet Jelly Beans (made with real fruit juice) to try. Gimbal's uses attractive packaging and you really do get alot of jelly beans in one bag. Gimbal's Fine Candies are safe for anyone who is allergic to different food products. None of Gimbal's candies contain peanuts, tree nuts, dairy, gluten or eggs...which is fantastic. I know of a family that deals with both gluten and dairy allergies and it makes snacking difficult for them. Ok, so I was not prepared for the huge selection of flavors in these jelly beans! The regular Gourmet Jelly Beans have 41 flavors in each bag and the Sour Gourmet Jelly Beans have 12 flavors. That certainly gives you a good choice when it comes to your flavor preferences, doesn't it? On the back of each bag, each flavor is listed out and you will find flavors such as cotton candy, ice cream shake, strawberry cheesecake, pina colada and many, many more. Wow! Then came the taste test. Would my children approve of Gimbal's Jelly Beans??? The answer was a loud, resounding YES! I don't know if they like the regular or sour flavors better but all of the jelly beans were gone in no time at all. The photo above shows them taking a break from playing outside to enjoy a quick treat. Hannah, my oldest, held the bowl and her brothers just helped themselves. Personally, I am in love with the Sour Gourmet Jelly Beans. They are definitely sour and don't leave me disappointed at all. 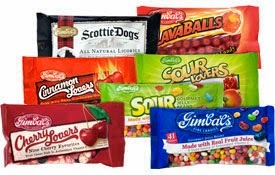 Along with the Jelly Beans I was sent, Gimbal's Fine Candies also carries Sour Lovers, Cherry Lovers, Cinnamon Lovers, Lava Balls and Licorice Scotties and more...all candies that are sure to please any palate! Aside from their store you can purchase Gimbal's directly from their website. Prices vary depending on what you purchase and the quantity. So, when it comes to pleasing your family and making sure you steer clear of pesky, common food allergens, be sure to check out Gimbal's Fine Candies! You can find them on Facebook as well so hop on over there and see what they have going on today. Enjoy!! Disclaimer: I received no monetary compensation for this post. I did receive free product for review purposes. All quotes and stock photos are from the Gimbal's Fine Candies websites and email. All thoughts and opinions are 100% mine.